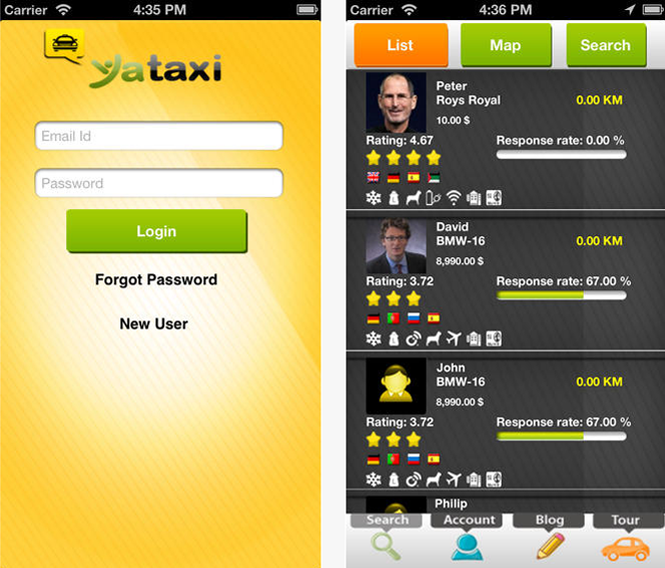 YaTaxi app that will scoping to work on existing Android and iPhone application of Yataxi, where we will be implementing new feature of taximeter. This new feature of existing Yataxi mobile application will enable driver and customers to view their ride details over app. In existing Yataxi Driver Android Application driver will be able to view a “fare and ride detail” button on the screen after boarding and can view amount, time and distance from the boarding point by clicking on button. Driver can calculate trip fare by manually entering the source and destination places through a “Calculate Trip Price” button on profile screen. Customer can view a “fare and ride detail” button on the screen after boarding and can view amount, time and distance from the boarding point by clicking on the button. Customer can calculate his fare for destination point by clicking a button on fare detail screen. In backend through admin panel admin will add normal rate and rush hour rate. Admin can add conversion rate for U$D to RD$ through admin panel. Yataxi has chosen us for our ability to develop complex apps and providing efficient solutions with logical approach to the requirements. The apps has only single version that is running successfully from the date it was released. What We Served Them: The motto of the proposed app solution is that driver and customers to view their ride details over app. Driver can calculate trip fare by manually entering the source and destination places through a “Calculate Trip Price” button on profile screen. Customer can view a “fare and ride detail” button on the screen after boarding and can view amount, time and distance from the boarding point by clicking on the button. Customer can calculate his fare for destination point by clicking a button on fare detail screen.